Scotland Sevens head coach Calum MacRae marked his first tournament by beating Belgium 33-7 to lift the second-tier Plate trophy at the Manchester Sevens. On Saturday the Scots lost 12-5 to Spain, then saw off Italy 24-19 and thumped Georgia 45-0. However, they conceded too many penalties against Russia on Sunday and lost 17-0 in the Cup quarter-final. Dropping into the Plate competition Scotland beat Germany 35-12 in the semi before the win over the Belgians. "This is a good starting point for this group. However, we have to keep setting our standards higher so the expectation levels of the team rises," said MacRae after the event at the AJ Bell Stadium, home of Sale Sharks. "A lot of my decisions this weekend were around looking at combinations to see what works within our game strategies. "We were one of the highest try scoring teams this weekend. I know this team can score tries, so I have asked them to raise the consistence of their performances in their defence. "Nyle Godsmark, considering the amount of involvement he has had at this level, I thought he stood out. I'm also pleased we have finished on a more complete performance that we can build on going into Bucharest next week." 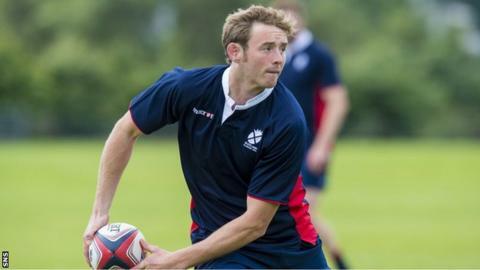 Scotland sevens play one more Rugby Europe Grand Prix Sevens Series tournament, next weekend in Bucharest, before their 2014-15 HSBC Sevens World Series campaign gets under way in Australia's Gold Coast in October. Scotland squad at Manchester Sevens: Scott Riddell, Struan Dewar, James Johnstone, Colin Gregor, Mark Robertson, Nyle Godsmark, Scott Wight (captain), James Fleming, Max McFarland, Gregor Young, Lewis Young, Colin Shaw.